I'm just wondering if you do this as well. I'll be looking at someone's photo of their latest incredible project with great admiration...and then...it strikes...DIY inspiration distraction. I end up looking 'around the room' in the photo and find more projects to stuff in my 'must try this' Pinterest file. Like this photo from Shaunna at Perfectly Imperfect. 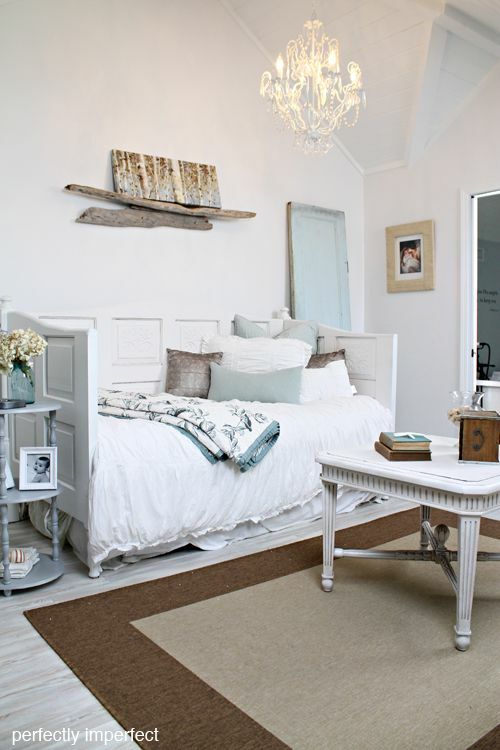 The incredible daybed repurposed from doors is the obvious feature. And what do I end up looking at? The cool shelf above made from driftwood pieces. I think to myself, "Ooh, I might not tackle a daybed like that...but I can sure give that shelf a try!" Is it just me? Or do you find yourself with DIY distractions as well? See... I don't think the bed is the obvious feature! I was looking at the shelf, the chandelier, the coffee table, etc. Shows that you cAn really DIY pretty much anything! Great room. That is hysterical...I noticed the shelf first too! How funny!